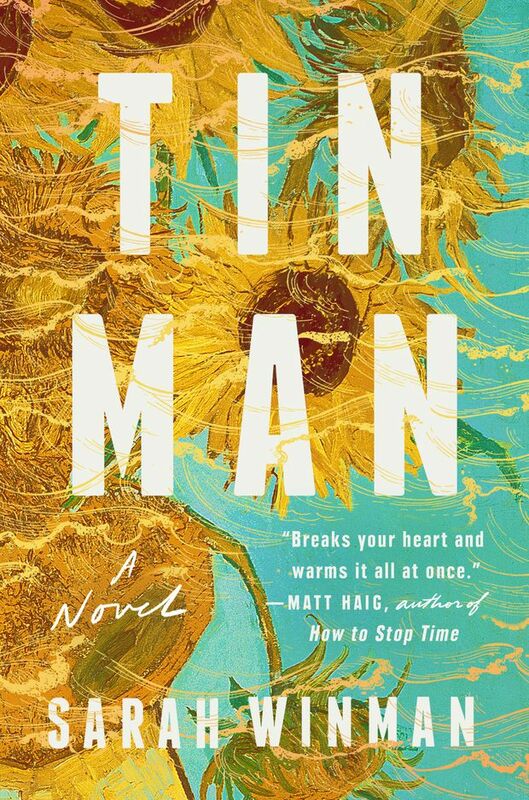 Tin Man, the third novel from internationally bestselling author Sarah Winman (When God Was a Rabbit, A Year of Marvellous Ways), contains all the complex characterization and emotional astonishments expected from her by now, but there are also departures from her trademark style. Gone is the somewhat more playful tone of her first two novels. There’s no magical realism to be found, but rather a drilling down through the cold layers of life. In the first half of the novel she offers an outsider’s view of Ellis, a middle-aged widower who exemplifies all that can be lost at a moment’s notice. I understood as I read about Ellis that Winman was drilling for hope. I didn’t believe she was going to find it and was amazed, enthralled — and brought to helpless tears — when she did. The novel opens in Oxford, England, in the 1950s, with a story about how Ellis’s mother, Dora, came to acquire a reproduction of the Van Gogh painting Sunflowers at a Christmas raffle. Ellis’s tyrant of a father, Leonard, tells her not to dare hang the painting and she, finally, stands up to him. A line in the sand: There is no love between them after this, only a tepid co-existence, but one within which Ellis’s mother is somewhat protected because she has shown her strength. The painting is a new world for art lover Dora, one with splashes of colour and light. Tin Man by Sarah Winman. Into the darkness of Ellis’s family life comes Michael, grandson of Mabel, the elderly and charming proprietor of a local general store. Until Michael entered the story, I wondered why Winman had chosen to give the sunflower painting so much weight. But through Dora’s long and passionate conversations with Michael, always about their shared love of art, the backstory of the work and its ultimate uniqueness is revealed. Dora tells Michael and Ellis that Van Gogh painted the fabled flowers for his friend Gauguin. There are clues in this conversation about what is to come next for the boys: great passion, great friendship, great loss. When Dora dies, Ellis’s father steps out of the shadows and puts an end to what he can’t make sense of. And with his mother gone, Ellis’s already ambiguous teenage feelings for Michael become even less clear. Dora had encouraged Ellis to become anything he wanted; Leonard forces him to quit school and start working at the plant. Leonard is a man afraid of what he can’t understand, a man who has never been given words to express anything beyond the norms of manhood in the culture he lives in. He’s doing his best to recreate himself in his son because he doesn’t know any better. We talk a lot now about giving boys and men more. This type of novel makes an argument for why allowing the heart to want what it wants is so important. “Love is love” can sound like empty words — until you read a novel like this and understand what happens to a heart that is commanded to close itself off. Before Ellis can be condemned to a life of repressed desperation, though — and perhaps before he can make whatever choice he might have made — he meets a young woman named Annie and falls in love with her, too. It’s known at the outset of the novel that Annie eventually dies in a car accident. She’s painted as a lost love, ethereal and angelic — the way we always remember people who have died too soon, any flaws they may have had erased by the tragedy. Ellis’s memories of her as flushed and naive, calm and accepting, are wrenching because of her absence. She loved him fully. He, it seems, never loved anyone quite enough. This is when the title of the novel begins to make perfect sense. Where is Ellis’s heart? The second half of the novel is from Michael’s perspective. It’s the 1980s and he’s estranged from Ellis and Annie, who were once his world. Now, he’s caring for a former lover who is dying of AIDS and reflecting on his past in a journal a therapist recommended he keep. Where Ellis held back, Michael bares all. Where Ellis refused to examine his friendship and eventual sexual relationship with Michael, Michael can often think of nothing else. Through his eyes Annie also becomes clearer, and so does Ellis’s mother. And, of course, Ellis himself comes into focus. Here is the heart. There is much economy of language in this compact novel, yet Winman still manages to finely draw every character. These people on the page are like those sunflowers on the canvas: striving, drooping, wilting, dying — and more than what they seem. These are real people, in all their anxieties and quirks, their good intentions and their unfortunate choices, just as we all are. And all this is an impressive accomplishment, even for a novelist who already seemed to know the truth about humanity by heart and could spill it onto the page with ease. Marissa Stapley is the author of the novels Mating for Life and Things to Do When It’s Raining.